Lacimehc Protech Private Limited - Other of process technologies and solution, plants and machineries & mechanical and piping engineering since 2013 in Vadodara, Gujarat. THE REACTOR IS THE GENERIC TERM FOR A TYPE OF VESSEL WIDELY USED IN THE PROCESS INDUSTRIES. SINCE VESSELS OF THIS TYPE ARE USED FOR A VARIETY OF PROCESS OPERATIONS SUCH AS SOLIDS DISSOLUTION, PRODUCT MIXING, CHEMICAL REACTIONS, BATCH DISTILLATION, CRYSTALLIZATION, LIQUID/LIQUID EXTRACTION AND POLYMERIZATION.THESE VESSELS MAY VARY IN SIZE FROM LESS THAN 1 LITRE TO MORE THAN 15,000 LITRES. THEY ARE USUALLY FABRICATED IN STEEL, STAINLESS STEEL, GLASS LINED STEEL, GLASS OR EXOTIC ALLOY. 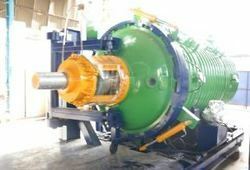 WE PROVIDE REACTORS WITH SEALING ARRANGEMENTS AS MECHANICAL SEALS, STUFFING BOX WITH /WITHOUT COOLING ARRANGEMENTS. By: Industrial X-Ray & Allied Radiographers (I) Pvt. Ltd.